Taking part in a trekking tour, tourists have to go on foot and prepare essential items by themselves. Because destinations especially in Sapa are usually on mountains or in forests, it does not appear in any map. It is also the reason why a trekking tour will give participants the feeling of conquest. Another advantage of a trekking tour is the low cost. However, it requires tourists to prepare carefully about itinerary, luggage and food. 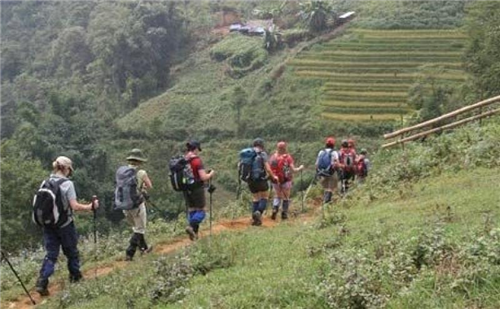 Following are some useful tips you will need for a trekking tour in Sapa for sure. – Warm clothing, wading boots, sport shoes and raincoats. Tourists are suggested to wear waterproof clothes or clothes to be quickly dried. If not, it is hard to move. – Shoes and socks of anti-leech types are essential especially if tourists go into the forest. Clothes should have many pockets. Backpacks should be made of waterproof canvas not to be easily torn. Backpacks should have belts to be pressed to the waist. – The medicines of cold, fever, diarrhea, antibiotic, bandages, vitamin and Snicker candy (a kind of candy providing energy) are indispensible. Some cosmetics for skin care are also necessary. – If tourists intend to rest in local villages that provide home-stay service then eating is no longer a problem. However, in case that you want to spend nights in forest or food of local people are not your appetite, it is suggested to bring some fast foods like bread, canned meat, packaged noodles and nutritious biscuits. – A normal person is able to walk from 12 km to 15 km per day. Based on that figure, tourists should research the terrain map to make a suitable plan. Visitors also should calculate the distance so that it is appropriate for health and against the dangerous situations. – It is recommended to keep track of weather forecast to get contingency plans ready. Referral should be prepared if your destinations are the borders. – When pausing for a little while, you should make use of your backpack as a backrest rather than taking it off. – There are many local villages in Sapa providing home-stay service so tourists can choose any of that to be an overnight stop. Otherwise tourists’ camps should be set near a village rather than in the forest. Local people are happy to help you cooking or buying ingredients for dinner. – When visiting a village, tourists should get acquainted and talk to local people. It is an opportunity to explore the unique culture of local people and understand the characteristics of upcoming ways. 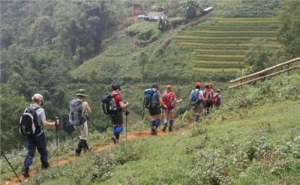 – A trekking tour is truly a worth-trying experience in Sapa. It will help visitors explore the wildest features of Sapa in a whole new way. It is the way that you will never forget.